There are a number of new broadcasting standards entering the market for quality (UHDTV 4K/8K), compression (HEVC) and satellite transmission (S2 Extensions). They are generating a lot of noise and hype, but underneath, there are real benefits to be gained to the user experience and business of being a broadcaster. They will only be beneficial if they are applied wisely and where they make sense. Gary Carter has many years of experience in the communications technology field. He is responsible for innovation and technology migration in future satellite distribution products and solutions addressing the needs of the radio broadcasters, television broadcasters, and cinema delivery solutions. The scope of which covers the delivery of live streams and files over DVB + IP satellite networks to traditional and cutting-edge applications. Current efforts are focused upon adding functionality to radio networks which drives incremental revenue or enhancements to the listener experience through receiver insertion of targeted of ads and programs. Consumer demand for high-bandwidth telecommunications and broadcast services is increasing, causing the satellite industry to look for additional capacity beyond the Ku- and C- satellite frequency bands that have been traditionally used to support these services. The little used Ka-band, which encompasses the frequency area between 26.5 and 40 GHz, offers a solution to the industry’s current capacity and bandwidth limitations, but is not without its own shortcomings. Paris-based Eutelsat is, currently, the third-largest satellite operator in the world (directly after Intelsat and SES) and the company is absolutely determined to grow. Used satellite uplink antenna systems can offer tens of thousands of dollars in capital savings when compared to new units, especially when considering the purchase of large antennas. Through the application of pre-owned systems, service providers can also rapidly launch new services, sometimes within weeks, when new gear could require months to install. High Throughput Satellites (HTS) promise to bring new opportunities to the satellite industry. However, as with any change in paradigm, there are also challenges and associated risks to the ecosystem that need to be heeded and handled. 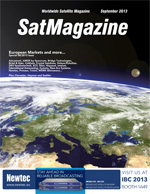 In this article, we will explore these issues from the viewpoint of the satellite operator. With help from Deluxe/EchoStar, a Hollywood coalition is taking movies from the skies. Setting the scene—the small European nation of Luxembourg has been involved in commercial broadcasting since December 19, 1929, when the government passed legislation that allowed a small society known as La Société Luxembourgeoise d’Etudes Radiophoniques to start transmitting radio programs to many nations in Western Europe. To do this, the society created the Compagnie Luxembourgeoise de Radiodiffusion, to be known as Radio Luxembourg. A recent, successful demonstration of 4K Ultra High Definition (UHD) delivery shows that Intelsat is capable of delivering the higher quality signals to consumers using transponders that are in service today. However, to take advantage of this potential opportunity, the broadcast sector must avoid repeating some of the mistakes that led to customer backlash against 3D and the subsequent shutdown of several, high-profile 3D channels. Black box solutions for redundancy switching have been somewhat limiting in their effectiveness. Redundancy switching between two parallel production chains is an important function that provides any broadcaster with the reassurance that, should a fault occur in one chain, the signal can still reach its destination with little or no noticeable interruption to the viewer. A Royal occasion in the United Kingdom was a significant catalyst for the development of outside broadcasting (OB). The BBC deployed eight miles of cable around London as well as a 10 ton precursor of today’s satellite news truck as the production unit in order to show television owning Brits the Coronation of King George VI in May of 1937. It was a mammoth, ground breaking operation that played an important part in moving television out of the studio. The freedom to ‘go anywhere’ to capture news and events has never been more crucial—journalists and broadcasters have always needed to be mobile, but never at the pace expected today. To meet those expectations, their comms systems have to be portable enough to enable them to get to a scene, set up, and be transmitting in minutes, something that is not always possible with OB trucks, triax cable, and where there may be terrain obstacles, or even the general public. For decades, mapping subsurface coastal zones has relied upon expensive ship-borne sonar and aerial laser scanning techniques. Recently, however, a new company named Proteus has changed the paradigm of monitoring the near-shore marine environment by offering satellite-derived bathymetric and seafloor mapping services. The 2nd Annual Space & Satellite Regulatory Colloquium, October 24th 2013 - Washington D.C. Inspired Ideas Begin with Inspired Conversation. Discover the Legal Future of Space. Satellite interference, as most readers are already aware, is a big—indeed, growing—problem in our industry. Interference affects the entire industry, from manufacturers to satellite operators, and, naturally, the end user. Monitoring has been proven to be an effective weapon in detecting and mitigating interference. However, the challenge for a great many users is how do you monitor for interference while on a restrictive budget. Change, as many great philosophers have said, can be positive and negative. However, for customers of the LDS shaker range, change is all about improving value. Moving into the second half of 2013, Spacecom, the operator of the AMOS satellite fleet and purveyor of the AMOS brand, is moving ever closer to becoming a global satellite operator. The recent selection of Turkmenistan’s capital city Ashgabat to host the 2017 Asian Indoor and Martial Arts Games has accelerated expansion of a massive new sports complex—this complex will become the largest such facility in Central Asia. Part of the project is a new state-of-the-art satellite communications teleport. The critical signal-switching and transmission subsystem between the space-to-Earth antennas and receivers at the new satellite facilities employs state-of-the-art technology from DEV Systemtechnik, which is based in Friedberg, Germany. Downlink: High Power GaN Ku-Band SSPA Systems, By Cristi Damian, V.P. Business Development, Advantech Wireless, Inc. Taking into account the latest achievements in the digital signals processing, encoding techniques, IP-based communications systems, new modulation and FEC techniques—the satellite communications systems today are moving away from Multi-carrier Transponder usage to a Single High Data rate carrier per transponder. New opportunities are opening to broadcasters who are willing and ready to create audience-specific businesses. We are not talking about meeting the lowest denomination of entertainment or reality programming that piques the interest of a large number of anonymous people. We are, however, talking about how to meet the needs of specific audiences that are highly interested in something special: Themselves and their individual cultures. At ECS we call this specialty: Diaspora World Broadcasting. Vern Fotheringham has been a serial entrepreneur in the broadband wireless and satellite communications industry for more than 25 years. He has created and built numerous successful ventures and contributed to large scale projects for major service providers, system vendors and software solution suppliers. He has also been a public policy and regulatory advocate for new telecommunications service rules and standards, and an inventor and creator of now globally adopted standards, innovative new products and services. As consumers develop a further understanding of what their payTV subscriptions could provide them across additional screens, satellite and cable TV providers now have an opportunity to leverage their content, brand and relationship with consumers to create competitive OTT (Over-The-Top) TV offerings.